Your Wedding Day was the most wonderful day of your life, so why not re-live it again! Share those intimate moments and special words that you offered each other. Reflect over the the loving years you have each spent together and celebrate the years yet to come! The best way to say "I love you just as much as the day we were married" is by renewing your vows. 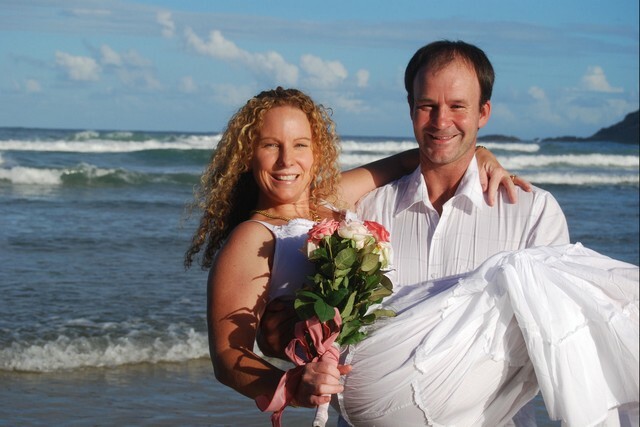 Couples come to the Coffs Coast, stay at our lovely beach location and before they know it, they are honeymooning all over again. Why not take this perfect moment to Renew Your Vows and celebrate "Your Romance" and turn your holiday getaway into another one of the most special memories in your life! 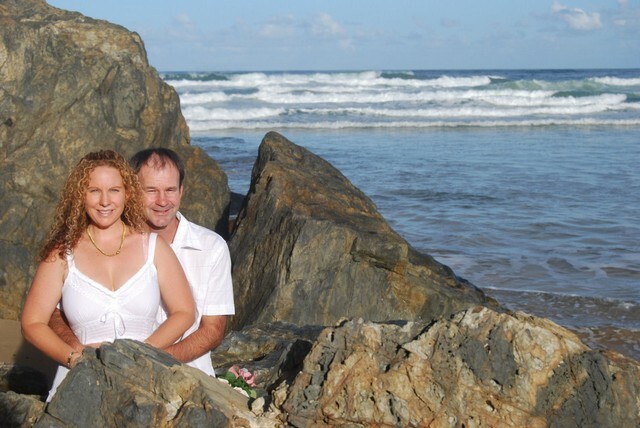 Couples can go for a romantic walk along the white sandy beach, then meet up with their celebrant amongst a private cluster of rocky boulders, whilst standing under the blue heavens, set against a backdrop of ocean waves and basking in the sunshine, they can look into each others eyes and fall madly in love All Over Again. You will have gone through many changes since your wedding day and had many different experiences. Travel, built a home or even celebrated the birth of children. You have this moment to celebrate "All that you have together" and the chance to appreciate your partner in a very special way. We often don't get the chance in our day-to-day lives to re-connect with our sole partner and express our love in the way we really want to. If you would like an opportunity to show the person you love, just how much you really "love them" and to offer them new heart felt commitments and do this in a very romantic and emotional way, then a Vow Renewal Ceremony is the way to do exactly this! This is your CHANCE! you have escaped the hustle and bustle of life and now have that special moment and time together. With a simple questionnaire, Donna will be able to create a very personalised romantic ceremony designed just for the two of you. Donna can mix all of your wonderful past memories shared, together with the New Promises and Commitments you will offer each other, to create a ceremony that will carry the romance and the love in your relationship into the future! Vow Renewals are very romantic. 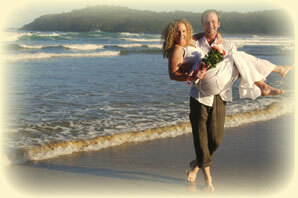 The ceremony can be performed with just the couple alone or with a whole group of family & friends witnessing. Each couples relationship has its own story and passion, so each ceremony is individual and unique! If you would like to see if I am available for your Vow Renewal Date, please complete the questions below and select the SEND button at the end. Photo Of the couple turned into a Beautiful Vow Renewal Certificate! 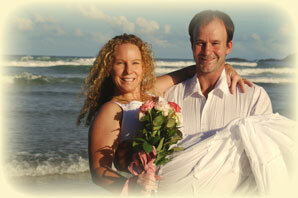 Postage Of your Vow Renewal PHOTO Certificate! Dear Donna we just wanted to drop a short note to thank you again. You and everything you did for us, was wonderful. We really enjoyed the whole experience and it was so very moving and meaningful. It was really nice to talk together and express our deep feelings for each other openly. Your questions have lead to many more conversations. Sean and I appreciated your direction through the experience and we really liked how you turned our words into wonderful vowels. The boys and our family and friends were so happy for us and can�t wait to see the photographs. We truly appreciate all you did for us in making another treasured memory.